Open your web browser and type login.schooldude.com into the address bar and hit the Enter key. Bookmark this page or create a shortcut on your desktop to make it easy to come back to this page later. On the Account Login screen, enter your Username and your Password. Make sure that Energy Manager is selected in the product box. If you have forgotten your login information, click the Forgot Login Name or Password? link under the Sign In button. Click Forgot Login Name? to have your login name emailed to you. Click Forgot Password? to have an email sent to you with instructions to reset your password. If you need additional assistance logging in, see our Login Help page. 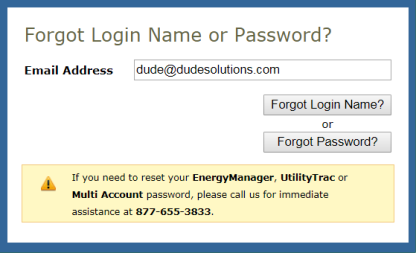 Open your web browser and type energy.dudesolutions.com/energymanager into the address bar and hit the Enter key. Bookmark this page or create a shortcut on your desktop to make it easy to come back to this page later. In the account login section on the left side of the page, enter your Username and your Password. The Navigation pane on the left side of the screen gives you tabs to navigate to important areas of the application. Click any tab to expand it and view more options under that heading. This section in the top left of the Dashboard gives you several sets of information. Click the General Stats button to view statistics on number of items in your account, system activity, ENERGY STAR information, and resources for your account. Click the Bill Stats button to view statistics for the number of bills and total cost for your facilities. You can click on the All link next to Facilities to filter the information by Facility. Click on the Announcements button to view announcements for your organization. Click on the Energy button to view the Monthly Energy Use graph which compares two years of energy usage by month. At the bottom of the graph, you can filter by facilities, change the time period, view different totals, or change the graph to show cost instead of use. Click on the Water button to view the Monthly Water Use graph which compares two years of water usage by month. At the bottom of the graph, you can filter by facilities, change the time period, view different totals, or change the graph to show cost instead of use. Click on the All Utilities button to view the Utility Cost graph. At the bottom of the graph, you can filter by facilities, change the time period, and choose to view this data as a bar, line, or pie chart. Click on the ENERGY STAR button to view your facilities' ENERGY STAR ranking. At the bottom of the graph, you can filter by facilities, change the time period, and change the sort of the graph. This section in the bottom left of the Dashboard gives you several sets of information. Click on the Quick Links button to view pinned links that take you to certain pages in the application quickly. You can pin a link to this section by clicking the pin icon that appears when you hover over a menu option in the navigation pane. Click on the User Logins button to view the most recent logins to your account. Click on the Social Media button to view various RSS feeds pertaining to energy management.